Each weekday, nearly 100,000 vehicles travel between Marin and San Francisco over the Golden Gate Bridge along Doyle Drive. If you have ever taken the drive through the city to the Golden Gate Bridge you have driven on an elevated freeway called Doyle Drive. It's been the road of choice for locals and tourists alike for the past 75 years. But it has long since past the point of safe driving. Doyle Drive is often among the first places listed when it comes to roads that are unsafe in an earthquake. Doyle Drive's days are now numbered. Doyle Drive will be closed from 8 p.m. Friday to 5 a.m. Monday as construction crews begin to take down the old road and transfer traffic onto a new seismically safe bypass. 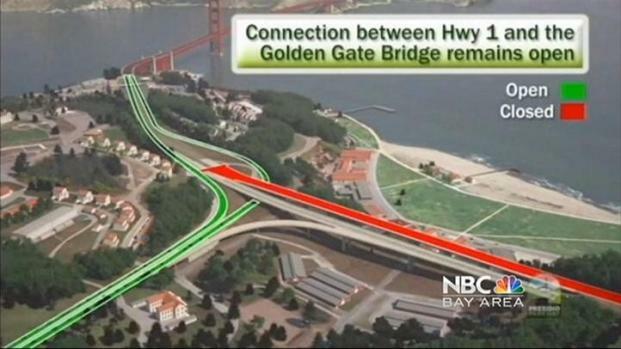 There will be no access to Highway 101 from Marina Boulevard or Lombard Street. During the closure weekend, crews will use a fleet of 40 demolition hammers, now in transit from sites around the country. The hammers will crush the old bridge. The chipping away of Doyle Drive will continue for weeks after the closure, but it will begin with 24/7 demolition this weekend. Traffic is expected to be a mess in the City. Drivers are asked to avoid the area and use alternate routes, including the Bay Bridge or the Richmond San Rafael Bridge. Built in 1933. Destroyed in 2012. A big piece of Bay Area history will come crumbling down this weekend. NBC Bay Area's Cheryl Hurd is in San Francisco, where demolition work on Doyle Drive begins tomorrow. Northbound traffic should use I-80/San Francisco - Oakland Bay Brid ge to I-580/Richmond - San Rafael Bridge. Southbound traffic should take I-580 to I-80 to I-280 towards the San Francisco Peninsula. Highway One/Park Presidio Boulevard to and from the Golden Gate Bridge will remain open, however, motorists ar e asked to avoid this route as it will be heavily congested. Extra ferries will be running for people who want to avoid roads altogether. For locals, the following two maps show what city leaders recommend when it comes to detours. This is a more detailed map showing ways to avoid the Doyle Drive closure. There is a good animation that explains the changes at this link. Doyle Drive replacement fact sheet can be found here. After the roadway reopens, motorists will travel on the completed bridge and tunnel and a temporary bypass roadway. The temporary driving condition will have five lanes managed by a moveable median barrier to accommodate shifts in traffic demand. 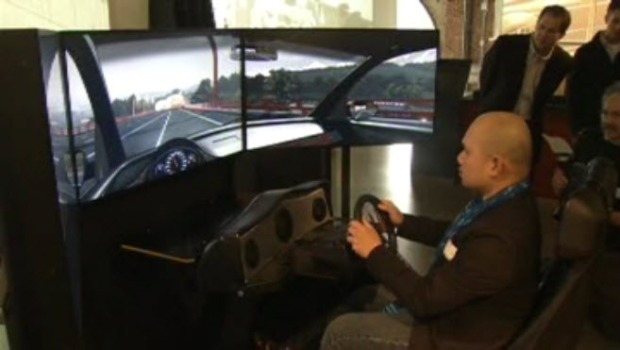 Expect delays as motorists adjust to the new driving experience. Below is a high res animation that takes you through the entire process, including a driver's-eye view.